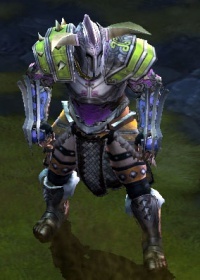 Armor Dyes allow players to dye certain components of gear. There are 20 known colors of armor dye, plus two special types: dye remover and transparent dye (which makes the item not display at all). Players purchase dyes in the game, then use them to recolor their equipment. Dyeing (not dying) will modify the color of an item; not the whole thing, though. Just some portion, often a border or sash, or else the background of an item while the metal remains a silvery hue. Many Legendary and Set items with unique graphics do not display dyes. Items that can not be dyed do not make up a visual component of the character anyway, so dying them would make no visible difference even if it was possible. The inky blackness seems to grow even darker when exposed to the sun, as though it were drinking in the very light that touches it. Sailors from Lut Gholein distill the waters of the Twin Seas and apply the mixture to their sails in order to blend in and avoid detection by pirates. The monks from the Order of Yir crush the first leaves of autumn into tea, and apply it to their robes during the Ceremony of the Harvest Moon. Once reserved only for nobility, this bright red pigment is now donned by both the influential and the courageous. Carried by the merchant caravans of the Dry Steppes to reflect the sun and hide dust. The bright colors of the Hezna flower are always a favorite amongst the fashionable elite of Caldeum. The Wardens of Duncraig wear coats of this color while patrolling the woods for poachers and wolves. Flecks of gold are melted into boiling oil to create a rare pigment used strictly by nobility. The bottle is warm to the touch, seeming to flicker with liquid fire. Named for the beauty of Queen Asylla, who once had a thousand gowns created in this color as a gift from King Leoric. Officers of vessels navigating the Skovos Isles wear deep blue garments to indicate seniority. This mysterious mixture seems to make any material it is applied to impossible to soil, swirling and coalescing like a cloud. Hunters and bandits alike use the bark of the Gorsenna plant to blend in with the shadows of the forest. For many years this color was forbidden to all citizens of Kingsport outside the Royal Family. Traditionally worn during the Hearth Festival in Bramwell to celebrate the first thaw of springtime. This brightly colored dye is extracted from spices shipped from Kurast at great expense. Leatherworkers use a variety of oils to seal their skins with a rich, natural brown pigment. Jars of crushed Veilwood petals are buried in the snow throughout the winter to create this popular hue. The gentle wind of the heavens cools the air, infusing the area with a soft glow. This dye has unlimited use. An eerie howl emanates from within as creeping shadows spill forth. This dye has unlimited use. The miraculous, mystical tonic that removes stains, cures rotfoot and tastes great! It's got what plants crave! Warning: Do Not Drink. All-Soap's Miraculous Dye Remover: Returns a single piece of armor to its original color. Lore: The miraculous, mystical tonic that removes stains, cures rotfoot and tastes great! It's got what plants crave! Causes materials to vanish before your very eyes! Be sure not to apply this to your undergarments. Vanishing Dye: Renders a single piece of armor invisible. Lore: Causes materials to vanish before your very eyes! Be sure not to apply this to your undergarments. Pale Dye (Removed from game) Beige Removed Many commoners use sunlight and minerals to bleach their garments an off-white color. Possibly removed from the game. Same as "Bottled Cloud." Rogue's Dye (Removed from game) Dark Gray Removed The preferred shade of those who do not wish to be seen, especially at night. Possibly removed from the game. Same as "Bottled Smoke." Dyes are purchased from vendors. All dyes are available at each dye vendor but not at the same time. Their inventory refreshes every 15 minutes. Note that Bottled Cloud and Bottled Smoke are only available in the Collector's Edition and cannot be purchased in-game. The Wandering Tinker in the Fields of Misery, Tinker's Hovel. Adenah the Curio Vendor, House of Curios in the Fields of Misery. Rodger the Alchemist, after The Sacrificial Hermit event outside Wortham in Act I.
Arghus the Collector in New Tristram (beginning in Nightmare). Vidar the Collector in Bastion's Keep Stronghold in Act III, additionally in the Bridge Stores on Rakkis Crossing on occassion. Vidar the Collector in Bastion's Keep Stronghold in Act IV. Delilah the Collector in The Surviviors' Enclave in Westmarch in Act V.
Some special vendors, such as Rodger the Alchemist or Javad the Merchant, will offer special discounts on items after a vendor-based event. For Rodger, once the player begins The Sacrificial Hermit event, he will sell the player dyes at half cost. A Barbarian who, quite frankly, doesn't care what you think. 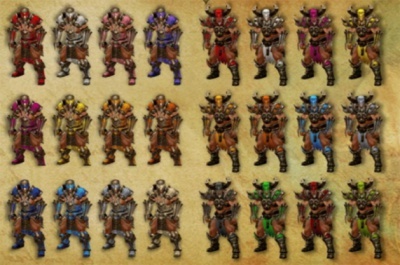 More information about how dyes will be obtained and how they will function in the game came from the Diablo 3 community manager, Bashiok, who answered some fan questions about armor dyes after they were revealed at Gamescom in August 2010. '''Bashiok:'''I wouldn't take the mechanics of how dyes will be accessed as gospel just yet, there have been many ideas on integrating them with other systems, but for the sake of implementation they're drops. They could stay that way, we'll just have to see. '''Bashiok: '''There are specific slots that are able to be dyed, and it's generally the slots where dying them would actually matter (ie they have some surface area to be dyed). The dye system is also not a tinting system. And by that I mean we don't apply a color shift to the entire piece of armor. Each piece of dyable armor is specifically designed and built with certain areas that can have their color changed. It could be as simple as a strip of cloth running down a chainmail chest piece, or as complex as an entire robe. We hand craft and designate these areas, and in combination with specific colors we've chosen, we can allow players to have a lot of additional visual variety, while maintaining a controlled look and style to the game. '''Bashiok:''' They're technically a two color gradient, which allows us to achieve a more natural looking coloration, but for the sake of simplicity, yes they're presented as a single color. I think the idea of having dyes apply effects in different ways is awesome, but don't forget there are plenty of other things going on gear that could be the basis for those types of effects as well. Q. Will the Collector’s Edition dyes have any sort of “particle effect” on the items, or are they simply dying them with a unique color? A. No they don’t have particle effects. For now they can technically only be single color gradients. Four different dye textures for a Barbarian chest piece. All 20 dyes in Diablo III on one armor set. Armor dye examples, shown in a GDC 2012 panel. • Increased Damage to Elites. • Reduced Damage from Elites. • Increases Resist All by 50–100 for 5 seconds. • Burst through Waller walls for 5 seconds. • Increases Life per Hit by 1500–3000 for 5 seconds. • Increases Life per Kill by 4000–8000 for 5 seconds. • Restores extra 25000–45000 Life over 5 seconds. • Increases Armor by 10% for 5 seconds. • Restores 10-15% of your primary resource when used below 25% Life. These are scaling, level 61-70 in RoS. This page was last edited on 3 August 2014, at 05:10.